(Click on images to enlarge.) 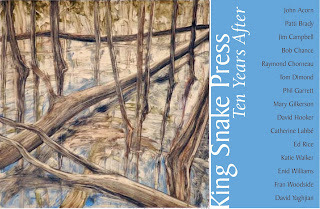 Above and below are the invitations to King Snake Press: Ten Years After, an exhibition on view at the Greenville County Art Museum June 5 through July 27. This exhibition is a dynamic and unique set of monotypes produced by fifteen South Carolina artists, including Vista Studio artist David Yaghjian. The fifteen artists have been part of the ten-year history of Greenville’s King Snake Press. 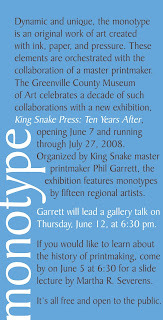 The show was organized by King Snake master printmaker Phil Garrett who will give a gallery talk on June 12 at 6:30 pm. Also on June 12 is the closing reception for Blues Chapel, an installation at the Region 2 Discovery Center in Edgefield, SC. 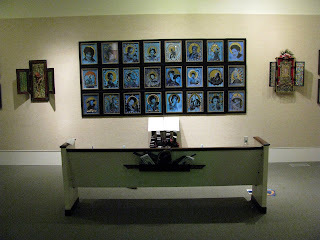 Created by Vista Studios artist Susan Lenz, Blues Chapel debuted in 2006 and will move from Edgefield to the Pickens Country Museum of Art and History for another two months. The opening reception in Pickens will be on Saturday, June 21 from 6 – 8 PM. In the post below is a video of the Blues Chapel as shown in Pickens.